DejaDesktop Calendar Wallpaper for Act! The Windows version shows calendar for Outlook, Google, Act!, DejaCloud and more. The Mac OSX version shows Mac iCalendar (Native Mac), Outlook for Mac, Google and DejaCloud. Your calendar is overlayed on your current wallpaper picture. You can use any desktop picture for the backdrop. 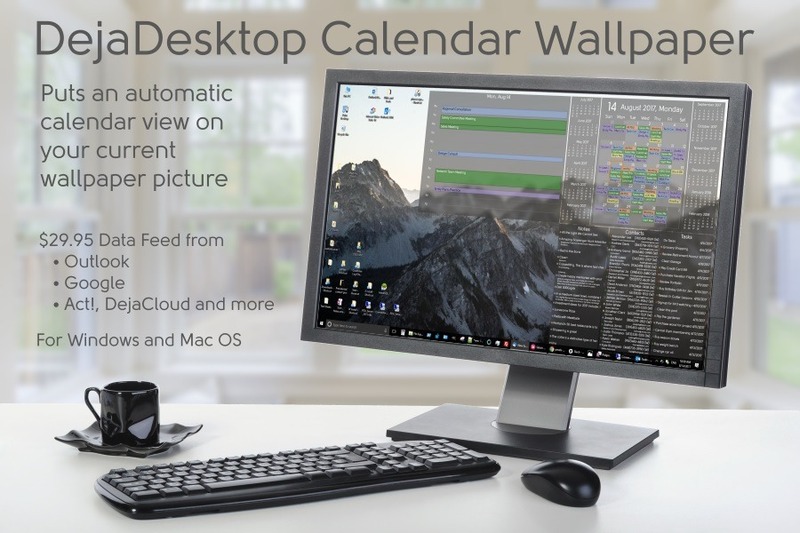 DejaDesktop merges your calendar on top of it. Free Monthly Calendar – without Data Feed: If you wish to have a Monthly calendar on your wallpaper without your personal data, download the program here and use for free! DejaDesktop Calendar Wallpaper – Data Feed If you wish to see your personal schedule on you desktop wallpaper, purchase a data feed. The cost is $29.95 for one computer, or $49.95 for three computers. Click here to order DejaDesktop Calendar Wallpaper. Two-week trial: Click here to try it free for two weeks. Free Tech Support : CompanionLink is proud to provide free technical support with US based technicians.